You can really tell someone is Italian by the quantity of pasta they eat…my family eats pasta almost every day…unlike me…I eat it once in a while, which can be a good reason to question my Italian nationality, let’s hope they don’t come and take away my Italian passport!! Oh well, I guess I am not much of a habit type of a person and that habits somehow disturb me and can give me anxiety. Some people find comfort in habits, in my case it’s the opposite. Everyone knows pesto which a famous paste made out with raw ingredients, that traveled beyond many borders. Of course there are many recipes for pesto using different ingredients and herbs. This particular pesto is called alla Trapanese, meaning Trapano style, after Trapano, a city in Sicily. This pesto is made with almonds and raw tomatoes ; you get a very fresh and light sauce which makes it so delicious. To transform the pasta and make it into a fun and original mixture, I love to flavor the dough with vegetables or herbs. You can add anything you want, saffron, mushrooms, tomato paste, broccoli, etc…and color your plate and pleasure your eyes and palate! If you want to keep this dish vegan don’t add the yolk in the pasta, it will turn out fine, and don’t add pecorino, and you’ll get an absolutely delicious vegan pasta dish. Pat dry peeled and seedless tomatoes to remove excess water. Using a mortar, blend all together together (except for pecorino) into a fine paste. Set aside. You can use a mixer but make sure not to blend the mixture into extra fine paste, you want some texture. Combine all flours together in a mixing container. 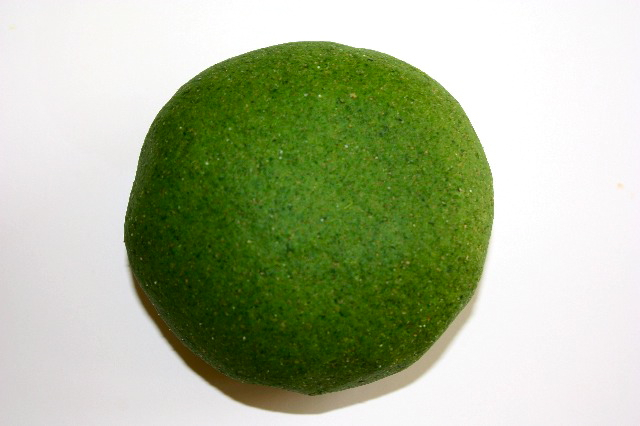 Add purée spinach and yolk, and start kneading the dough thoroughly for about 20-30 minutes. At this point, the dough will be elastic and smooth. On a large wooden board (spianatoia), with a pasta rolling pin, make a thin sheet. You can use a pasta machine if you have one and not used to rolling pasta sheets. Cook pasta in boiling water for a few minutes, drain and toss with pesto. Add pecorino and serve hot. This entry was posted by silvia on June 24, 2010 at 3:16 am, and is filed under Pasta, Vegetarian - dairy. Follow any responses to this post through RSS 2.0.You can leave a response or trackback from your own site. 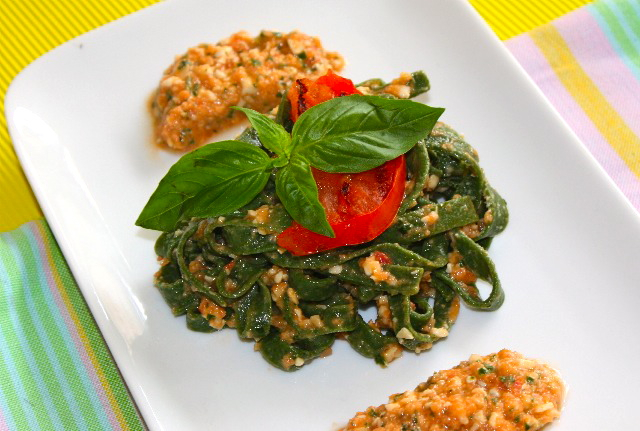 This is a beautiful pasta dish, I love the spinach pasta with the unique pesto, I personally can eat tomatoes everyday during the summer! Oh, how I LOVE the green pasta! This is a perfectly rich and comforting meal. The tomatoes in the pesto add quite a nice twist! As always, this is just brilliant! As a person who makes his own pasta, I can see you did a fabulous job with the tagliatelle. Pasta is incredible fun to make and you really can get creative with the ingredients. using tomatoes? great. will have to try this in summer. This looks amazing! My friend just bought a pasta maker and we’ve been experimenting in the kitchen. I want to give this a try. I tried this pesto once but I used dried basil cos it was all I had. I never knew it was Sicilian! Although the recipe I have does not contain exact measures, I think I will give yours a try. The pictures look great! You know I love green! And this is absolutely my kind of recipe. Such refreshing colour. I still remember the squid ink spaghetti you made a couple months back. I think if you match them together….wow…. just imagine the colours! Hey, maybe you could try red beet spaghetti too! Black, green & red ^_^ Hope you’re having a wonderful day, dear. Wow, love the green pasta!! Looks delicious! This looks really delicious and I always have these ingredients on hand. I will give it a try. Thanks for the recipe. I’ve never seen such an intensely green spinach pasta before!! That is just gorgeous!! The pesto sounds wonderful, of course, but I really am drawn to your beautiful tagliatelle, perhaps because I very, very rarely make my own pasta. You need, this pesto from Trapano is one of those dishes I’ve heard of but never tried… and now that tomatoes are beginning to get good, I will definitely do so. Thanks for the recipe! You know, this pesto from Trapano is one of those dishes I’ve heard of but never tried… and now that tomatoes are beginning to get good, I will definitely do so. Thanks for the recipe! What a beautiful dish! I would love to try it. 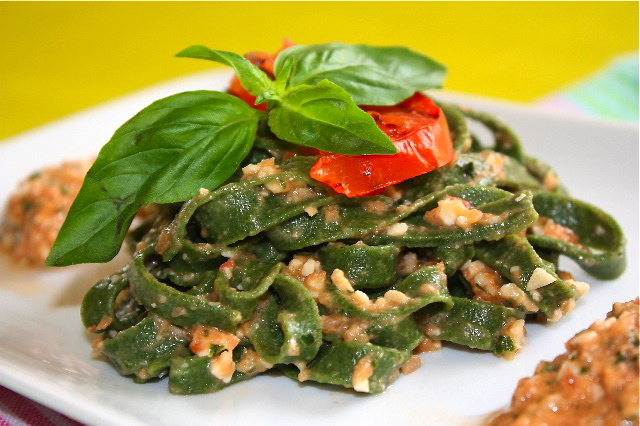 Brilliant spinach pasta, Silvia! I don’t eat pasta very often, but when I do, I want it to be a dish like this! The pasta looks wonderful and great pesto recipe, I really like tomatoes in pesto! A beautiful dish ! I’ve never tried my hand at pasta, but this dish may change my mind. Ces pâtes toutes simples semblent vraiment délicieuses (pâtes fraîches + sauce goûteuse = plaisir assuré)! haha, you’re so funny Silvia. this is a beautiful pasta! i love colored pastas that come from the vegetables which are included, like how your pasta is green from the spinach. so healthy, light, and delicious. This sounds so flavorful. I really would love to try it. I have never used farro flour before. J’adore les tagliatelles aux épinards. J’en mangeais souvent quand j’habitais au Maroc. Cannot wait to try this! SO happy that I stumbled across this recipe tonight. Merci! I am speechless. This is absolutely stunning!! Pesto, of course, is any sauce that was originally crushed together. The famouse version is from Genoa and Ligura, but the tomato version (and other pestos with other nuts, especially wallnuts and almonds) are equally tasty. Thanks for this recipe. Now that tomatoes are in season I’m going to be trying it. Cmq anche qua non si scherza…mi fai venir voglia di tagliatelle all’1.14…:!!!! This is an amazing version of pesto and I must try it!!! I am on a alkaline diet (vs. acid) so I make a pesto with all that you have in yours and pumpkin seeds and sun dried tomatoes (very alkaline) love your recipes… very inspiring! J’adore cette sauce! Je viens d’ailleurs de voir une recette similaire chez Ivy a Kopiaste; elle admet qu’elle est italienne et non pas grecque! Sinon, je suis en train de collectionner les recettes de pâte, vu que mon père a du sang italien et n’adore manger que les pâtes. 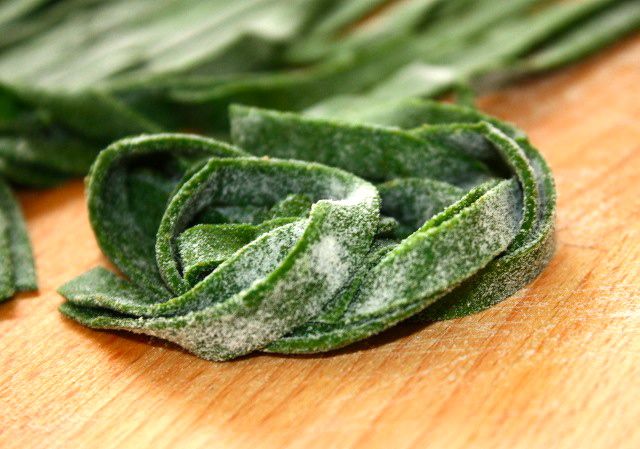 Silvia – I like this recipe as a basis for different flavored pasta. I’ve only made fresh pasta once and absolutely loved it…no comparison when homemade! What a lovely sounding pesto with almonds. Silvia-everything you make looks so beautiful and delicious. Oh, to be the lucky person who eats all your creations! I recently learned about this pasta variation but have yet to try it. Sounds great indeed! Ooh, trapanese sounds so good. And what a perfectly healthful dish with the almonds, tomato, & homemade pasta-this is summer food!